The newest Soaps.com Young and the Restless spoilers indicate a tense week ahead for members of the Newman family and others, as Billy will have to help Summer out again. By week’s end, Jill returns to find everything’s gone sideways in Genoa City. Please return to this page each day for new spoilers from the day-ahead episodes of Y&R. In the latest Deconstructing Y&R, JT’s chilling return was fun but far out. Fun video! Jacqueline Wood & Kelly Kruger’s battle it out in the kitchen. In today’s Y&R recap, Ashley quits Newman and rejoins Jabot, while Nikki & Sharon get a fright. Soaps Roundup: A refresher of what happened in last week’s Young and Restless storylines, plus a look back at the other three soaps. In this week’s Spoiler Digest, terrible news, disturbing messages, we have new spoilers for B&B, Days, GH and Y&R. 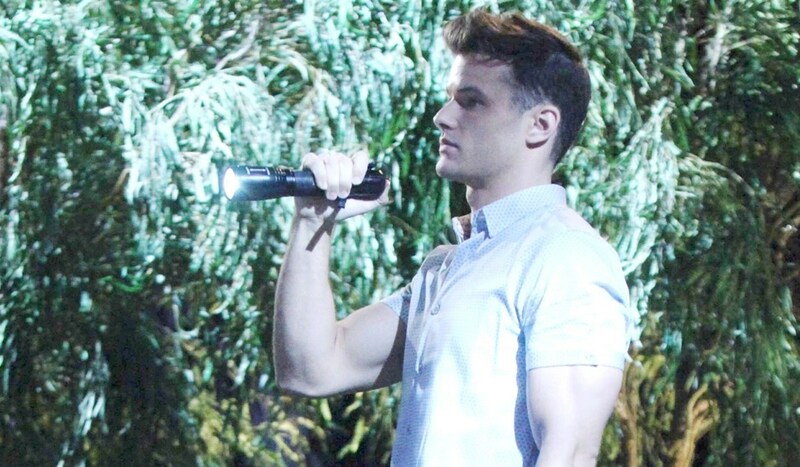 In today’s Y&R recap, Kyle’s arrested for digging up Phillip’s grave, while Nikki and Sharon panic over JT being alive. In Monday’s Y&R Spoiler Video: Nikki fears JT is alive, Neil has a proposal for Ashley, and Kyle is busted. Kyle’s in over his head. In today’s Y&R recap, Billy enlists Summer’s help to win back Jaboat, while Cane confronts Jack & Kyle. Billy must cover for Summer. Cane receives a promise from Jack. Just in… Y&R alum Sean Carrigan’s new racing film stars Matt Damon and Christian Bale. In today’s Y&R recap, Nick & Victor learn who gets custody of Christian, while Phyllis worries Billy’s cheating. Sharon and Nick look to the future. Upcoming exit… Mishael Morgan is leaving Y&R and shared a goodbye message and photo. In today’s Y&R recap, Neil and Ashley share a little romance, and a kiss, while Billy digs himself in deeper. Victor gets a strange message. Mariah needs advice regarding Tessa. Ashley is surprised by Neil. Thad Luckinbill is back at Y&R as JT with more drama ahead for Genoa City. In today’s Y&R recap, Jill confronts Kyle and Jack in a rage, while Victor meets JT in an alley. In Friday’s Y&R video, Victor & JT have a showdown in a dark alley. Victor anticipates a showdown with JT. Jill arrives in Genoa City to chaos as Jess Walton returns to Y&R. Neil gains a contract with a company that cut ties with Newman Enterprises based on insider information from Ashley. Neil plans a ‘thank-you’ dinner for Ashley and tells her it’s time they both let go of work-related items and concentrate on each other’s company. Victor interrupts Neil and Ashley as things are turning amorous. A siren sounds as Kyle stands in Phillip’s grave. Nikki tries frantically, but unsuccessfully, to warn Victor that JT is alive and on the ranch property. Nikki and Sharon tell Nick they saw JT, and he goes looking for him…with the fireplace poker in hand. Hilary and Lily spar verbally. Sharon worries to Phyllis that while they sit there, JT is telling Victor everything about that night. Departure announcement… Eileen Davidson’s leaving Y&R as Ashley Abbott. Dayplayer roles… The latest Y&R casting calls for upcoming scenes.